What are the main threats to bottlenose dolphins in the Shannon estuary? Throughout the world small cetaceans (mainly dolphins and porpoises) are facing the same general threats. These include pollution, interactions with fisheries (both operationally through incidental capture and biologically through competition for fish resources) and disturbance. As we are only just starting to try and quantify the potential threats to dolphins in the Shannon estuary these general threats are a good starting place. The Shannon river is Irelands’ longest waterway and all the discharges throughout its long journey to the Shannon estuary will accumulate downstream. Discharges from industry, agriculture and domestic houses all end up in the Shannon so it is reasonable to assume that pollution may be a real threat to bottlenose dolphins in the estuary. Pollution comes in many forms from sewage, leading to enrichment and excessive algal growth to chemicals, which may accumulate in animals bodies throughout their life. A recent study suggested that despite local organic waste discharges, the strong ebb-tide currents and the large freshwater inflow in the Shannon are apparently sufficient to prevent serious de-oxygenation and algal blooms in the estuary. A study was carried out in 2000 to assess whether persistent pollutants, which accumulate in the dolphins blubber may pose a threat to their heath. Samples of blubber were taken from resident dolphins using biopsy darts and were tested for a wide range of organochlorines. Although levels were high in two male dolphins, overall concentrations were below the levels thought to damage their health (see Papers for results). Commercial fishing in the Shannon estuary is limited to salmon fishing, potting and seasonal trawling, mainly in the autumn. 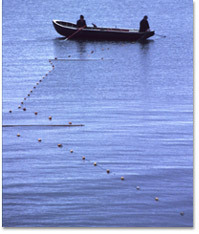 Although salmon fishing is carried out using monofilament nets, reports of entanglements are rare and are not thought to be significant. Pair trawling for herring off Loop and Kerry Head may potentially catch dolphins but no monitoring has been carried out. Recently trawling for sprat in the estuary has been carried out but this fishery is unpredictable and is likely to remain opportunistic and relatively small. A proposed offshore windfarm in the Shannon estuary off North Kerry, between Ballybunion and Kerry Head has been granted an exploratory licence from the Department of Communications, Marine and Natural Resources. The proposed farm will consist of some 60 turbines and the licence has been granted on the condition that “special consideration is given to the dolphins in the estuary”. 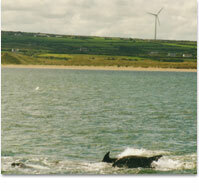 The potential impact of offshore windfarms on dolphins is not known. Impact may be positive, creating artificial reefs around the moorings, which could increase fish abundance or negative with displacement of prey species or dolphins themselves due to disturbance. This disturbance may be acoustic if there is transmission of sound or vibrations from the rotating blades into the water. The proposed site of the Shannon estuary offshore windfarm is potentially a good foraging area as it is adjacent to the Cashen river estuary. Little is known how dolphins use this part of the estuary and a full environmental impact study is required to assess potential impact and suggest mitigation.